The industry’s first ever externally adjustable slicing. Easily adjust from thin to thick (1mm to 6mm) slicing by simply sliding the lever from left to right. Adjusts to three different widths for processing foods of all sizes and provides more options for slicing variations. Round carrots for a salad or horizontal slices for the grill. KFP1333 Food Processor Almond Cream is rated 4.3 out of 5 by 39. Rated 5 out of 5 by Bellette from Sleek look with the grunt to do all the hard work. Have only just started experimenting with my food pro. Loving it! Will be checking Kitchen Aid recipes to do lots if cooking. Rated 4 out of 5 by dell53 from Good quality food processor I bought this food processor a couple of weeks ago mainly because I needed a new and larger food processor that was reliable. I have previously bought KitchenAid appliances and they a good quality and towards the top of the range in kitchen appliances. The only thing that would have been of great benefit if there had been some basic recipes in the instruction booklet which suited Australian consumers. There are some videos which are reasonable, but not quite in enough detail for me personally. Rated 5 out of 5 by Big Jack from Just love the quality I purchased the food processor to accompany my kitchen aid mixer - but to push it off the scale include a recipe book like you do with the blender....! Rated 2 out of 5 by DakotaConrad from Worked great for 1.5years... My husband and I received this as a wedding gift and used it only a few times. I went to use it to make my Thanksgivng prep easier & the slider knob on the front has jammed and will no longer work. I emailed Kitchenaid with the warranty info & they told me that I had to take it in to a repair shop. The only one in my area has very low reviews and I can't see them being any help to me. Rated 4 out of 5 by Caught from Not Quite KitchenAid We have used this food processor about once per week for three years, probably no more than a hundred activations in total. One day it simply didn't work, without apparent cause, and has never worked since. It was clearly an electrical or electronic fault of some time, not a mechanical failure. Although of reasonably good quality finish, the unit simply did not offer us the reliability that one would expect of the KitchenAid brand (and price point). We considered a repair but, once long regional drives and time was factored in, the repair support in our region would end up costing us more than a new machine was worth. 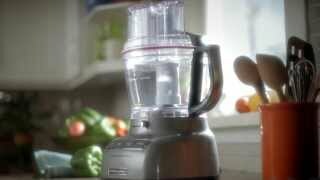 We decided to replace the machine and looked at other food processors in the market. But here's the thing: we really liked the functionality and utility of our original KitchenAid food processor, and it was just the right size for us. So, in spite of effectively rewarding poor reliability, we decided to replace it with the same model. Perhaps that is a foolish choice, paying a second time for a product and repair network that let us down, but perhaps our experience of unreliable electronic components was just a one-off. I would definitely recommend this product for its design and utility, but don't expect the same reliability from the KitchenAid brand that they once offered. Rated 5 out of 5 by Scotty162 162 from Great Looking Appliance Had a great deal of trouble trying to start it. Reason I found out was I was not pressing hard enough on the 1, 2 or pulse button. Once it started, loved the feature of changing the thickness as I experiment on the coleslaw I was making. Super fast and easy to clean. Pity I can't buy a cover for it.